Here at least, my friend Jan pointed out to me, is one place where things remained the same after Vatican II. Which goes to show, was the implication, that Vatican II conserved many good things. 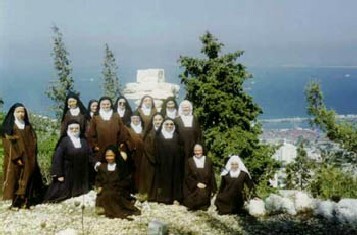 She was talking about the Discalced Carmelite Sisters who live on Mount Carmel, which looks out on Haifa Bay in Israel. Carmel is the mountain of Elias, where he humiliated and killed the 400 false prophets of Baal and later, the site where the first Carmelite hermits settled to pray for coming of the Messiah. On clear days, the sisters can look out and see the summit of Mount Tabor, the site of the Transfiguration. At left is a picture of the community taken in 1994 and posted on their website. Dressed in full habits with their characteristic sandals, they lead the contemplative life that the Church has always praised. They make rosaries and construct holy cards with pressed flowers from the Holy Land. They pray the Divine Office and meditate in quiet personal prayer for two hours each day. It does seem just like the good pre-Vatican days, Jan. But there is a big change, not on the outside, but on the inside. Throughout their beautiful history, the Carmelites embraced the life of prayer and sacrifice offered for the Holy Church and the conversion of sinners. “Is not the apostolate of prayer,” asked St. Therese of the Child Jesus in her Autobiography, “higher than that of preaching? 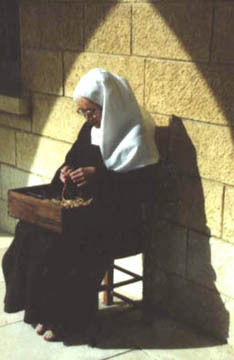 For by our prayer we form laborers who will preach the Gospel and save thousands of souls by bringing them into the Catholic Church.” Prayer and sacrifice - the invincible arms of the Carmelite to help bring non-Catholics to the light of the true faith and overcome the obstacles that keep them from the One True Fold. In fact, the Carmelite monastery at Haifa was founded in 1892 by two converts, twin brothers, Frs. Joseph Lemann and Augustin Lemann, contemporaries of the Ratisbonne brothers, another famous pair of Jewish converts. The Lemann twins were born into a wealthy, aristocratic Jewish family in Lyons, France. The two young men converted at age 18 and were almost killed by several uncles after they learned of their Baptisms. The brothers publicly defended their conversion, and went on to become priests, theologians, and canons of the Church. 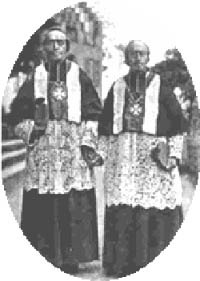 They became good friends of Pope Pius IX and circulated a Postulatum, in which they called on the Jews to recognize Our Savior Jesus Christ, and join the Catholic Church. Later, they founded the convent of sisters on the mountain of Elias so there would be Carmelite sisters living on Mount Carmel praying and sacrificing for the conversion of the Jews. “How can you be a servant in Israel if you speak about conversion?” Mother del Bono asks, trying to justify the change. Behind the metal grille in the parlor, she puts her hand to her forehead to emphasize how absurd she finds such a notion: “Imagine someone coming in here and telling me to become an Adventist or a Muslim…” The real absurdity is that Mother del Bono would censure more than 2000 years of Carmelite tradition by saying things like that. “We pray that people come to the full revelation of God… If they are good Jews and we are good Christians, that is already glory to God without forcing anyone to change. That is what the Carmelite sisters of the Monastery of Mount Carmel believe today. Mother del Bono admits that some time in the past, the sisters on Mount Carmel prayed for the conversion of the Jews. “It’s incredible to think this,” she says in amazement. She has been so indoctrinated with the teaching of Vatican II and the ecumenism of John Paul II she can’t even imagine such a thing as praying for conversion. She claims she is not even sure when the mission changed. But it isn’t difficult to pinpoint the time: it was after Vatican II. The sisters are all well acquainted with Nostra aetate, the document that inaugurated a new theological approach regarding Jews and Judaism that rejected the traditional Catholic missionary spirit as negative. The old spirit was reformed and reformulated into another, which calls for an opening and dialogue of the Church with the false religions. The insistence of Paul VI and John Paul II on this has been decisive for them. Today they follow the theory of a supposed “hierarchy of truths,” taken from the Council decree Unitatis redintegratio, a. 11. In the progressivist jargon the term has come to mean that every religion has some bit of the truth that makes it valid. From this and other Council documents, the sisters were wrongly taught that the Catholic Church would not have a total and exclusive possession of the truth, and that it would be egocentric to insist on this. The plenitude of the messianic promise would embrace all religions. The unity desired by Christ would imply that “all churches acknowledge and recognize each other, and not that all other churches return to the Catholic Church.” (2) A concept, by the way, that collides head-on with Church dogma that outside the Catholic Church, there is no salvation. It also denies the missionary character of the Church. The Carmelite sisters in Israel were taught to admire John Paul II and everything he does and says: his millennium visit to Israel, his apology to Jews for past hostile attitudes, his preaching in the Roman synagogue, his interfaith meetings. With this example coming from the top of the Church, they became convinced that their Carmelite mission should change. They started to pray for better understanding between religions, instead of conversion to the Catholic Church. The sisters are still conservative enough to continue wearing the traditional habit, but they no longer follow “yesterday’s doctrine.” They became progressivists in their thinking. The affirmation that conversion in general, and the conversion of Jews specifically, is no longer necessary for their Carmelite vocation contradicts the very purpose for which their particular order was founded. Their saintly founders clearly preached that the Jews should come into the Catholic Church. Their strong and unambiguous words on this topic are forgotten, or concealed, today. The implementation of Vatican II ecumenism has struck one of most radical blows in History against the Catholic Faith and Holy Church. As you can see, Jan, the whole missionary past of the Church is tacitly judged as erroneous. Vatican II aims to close the era in which Church strove for the conversion of heretics and pagans. So we have a flagrant contradiction: the sisters are in full habit and praying the Office, but the reason for their being has changed. It is what the progressivists want. Keep some of the traditional appearances, but change their mission, their idea of the Church. The habits are permitted, so long as the doctrine changes. I have a good hunch this is what happened to many of the conservative and so-called traditionalist female religious orders that compromised by accepting the bad teachings of Vatican II. They are fruit that still have a good appearance, but are rotten inside. 1. “Cloistered Nuns on Mt. Carmel Pray for Jews to be Jews,” Interview of Sister Angela del Bono with Julia Lieblich, AP online, March 25, 2000. 2. See this affirmation made by council perito Fr. Edward Schillebeeckx and others in A. S. Guimarães, In the Murky Waters of Vatican II, Chapter IX, §§ 51-55. See also his Animus Delendi II, Part II, Chapter IV, in which he demonstrates how ecumenism aims to destroy the missionary spirit and militancy of the Catholic Church.